One can make money individually or professionally by selling things on Amazon. If you want to sell any product on Amazon, then first, you have list the items you want to sell. One can make money individually or professionally by selling things on eBay. If you want to sell any product on eBay, then first, you have to create a seller's account. List the product that you want to sell. By connecting your online store with your Facebook store, you can get the customers from both the virtual worlds. Google YouTube is rolling out new ad extensions that will allow any video to become "Shoppable". It means companies will be able to buy visual ads with links to buy products found on their own website. Would you like to start today? If you do, just scroll up and hit the "Buy Now" button. 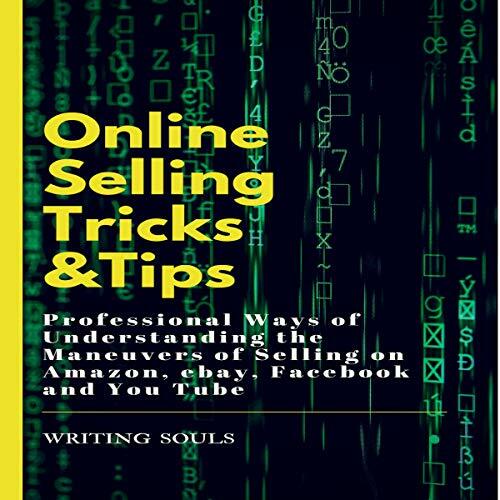 very good book to master the skill of sell your product in online platform. very useful book for new people in this world. very very useful tips and tricks to start a career in online business through amazon, facebook, twitter etc. This is the most helpful book on internet marketing. After listening this book, I am confident about staring online business. listening this book from Writing Souls was great. got a overall idea of online marketing just by listening once. excellent writing from the author. very helpful book for online marketing. I am satisfied with the book. masterpiece book. this book help a beginner to intermediate person in the world of online marketing. I highly recommend this book e marketing book to the new comer in online business. excellent advice are given..
must listen this book to start online marketing with knowledge and confidence. apply the tips given in this book and you will be the master very soon. the content of the book is really good and useful. it will give you confident to start marketing your product in online platform. You will advises, tips and tricks on online marketing from expert in the industry. I am thankful to the publisher.